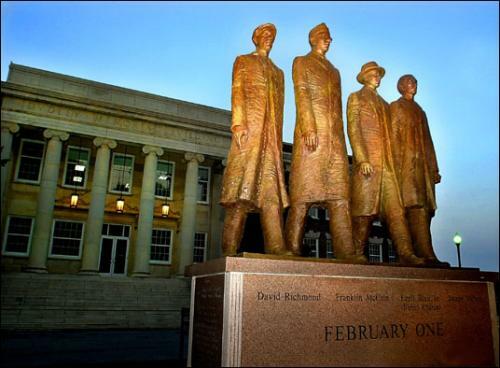 On February 1, 1960, four students from the college made history. On that date David Richmond, Franklin McCain, Ezell Blair, Jr., and Joseph McNeil sat down at the “whites-only” lunch counter at the downtown Greensboro Woolworth’s store and asked for service. Their peaceful and ultimately successful protest ignited similar demonstrations over the state and eventually the entire South and ushered in a new phase of the direct-action civil rights movement. In 1967 the name was changed to North Carolina Agricultural & Technical State University. In 1972 North Carolina A&T became a constituent institution of the University of North Carolina’s 16-campus consolidated system. Today, NCA&TSU, with approximately 10,000 students, offers degrees at the undergraduate, master, and doctoral levels and is classified as a doctoral and research-intensive institution by the Carnegie Foundation for the Advancement of Teaching. J. Brubacher and W. Rudy, Higher Education in Transition (New York: Harper & Row, 1976); "North Carolina A&T Milestones," Archives & Special Collections, North Carolina Agricultural and Technical State University, 2000; M.A. Brown, Greensboro: An Architectural Record (Greensboro, N.C.: Preservation Greensboro, Inc, 1995). (Greensboro, N.C.: Preservation Greensboro, Inc, 1995).